Kristin Sabbi is a doctoral candidate at the University of New Mexico. She was awarded a Leakey Foundation Research Grant during our spring 2016 cycle. Click here to read a brief summary of her project. 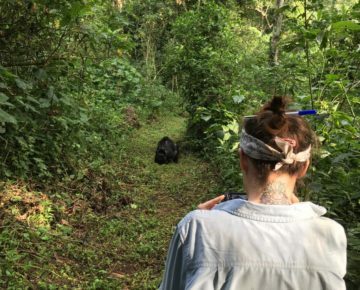 Here she updates us on her third field season in Kibale National Park, Uganda. This year marks my third and final dissertation data collection season, thanks to The Leakey Foundation. 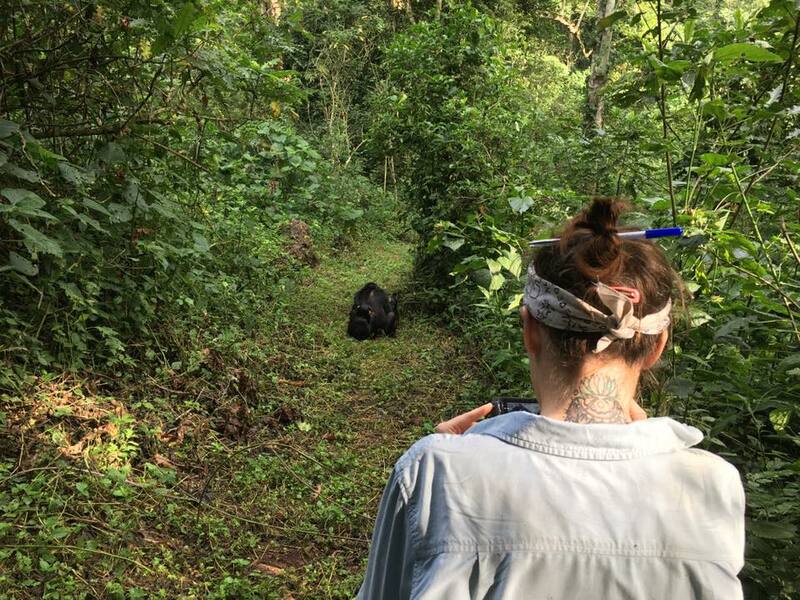 Over the last two field seasons, in 2015 and 2016, the chimpanzees at Kanyawara have been very good to me. As I’ve followed their infants and juveniles, I’ve witnessed some pretty incredible behaviors ranging from ultra-gentle males to unique tool use to once-in-a-lifetime chance events (both happy and sad). In 2015, I saw my first nursery play group of about a half dozen adult females and their offspring. I also followed an infant as an adult male carried her on his belly for a good 100m just to set her down and tickle her for almost an hour. In 2016, we were there to witness characterize how the rest of the group responded to both births and the falling death of a two-year old. But this year, brought one of the most amazing phenomenon I might ever be so lucky to witness. But first, a bit about chimpanzees to help explain how incredible this summer was. Chimpanzees exhibit what we call a “fission-fusion” social system whereby the larger community breaks apart into smaller subgroups and ranges together throughout the day. For instance, our community has just under 60 chimpanzees, but you might find all kinds of variation among subgroups in a day. 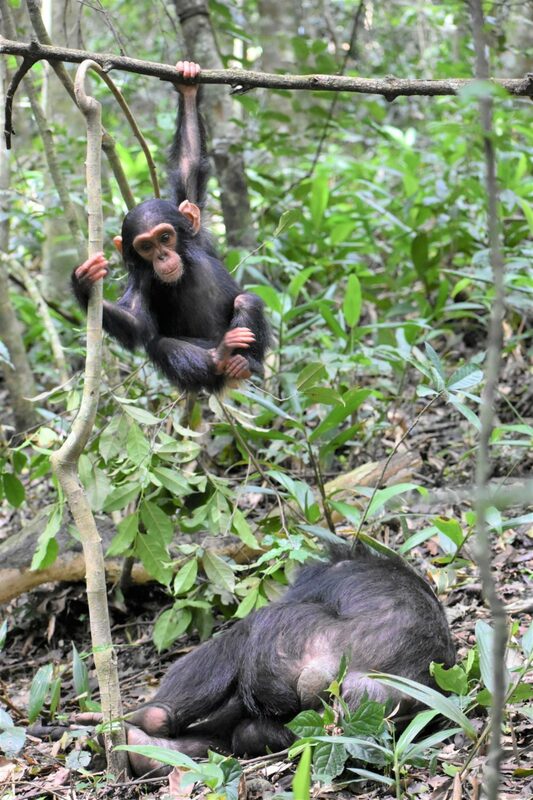 One chimp might feed in a tree on their own, or one mother traveling with just her offspring, or a small band of five or six males grooming on the trail, up to a mixed party doing any of the above! On average, the groups that I’ve followed during my data collection have averaged seven to 12 members (including infants and juveniles). Individual membership in these parties can be highly fluid and flexible throughout the day such that one chimp might range with a number of different parties between dawn and dusk. 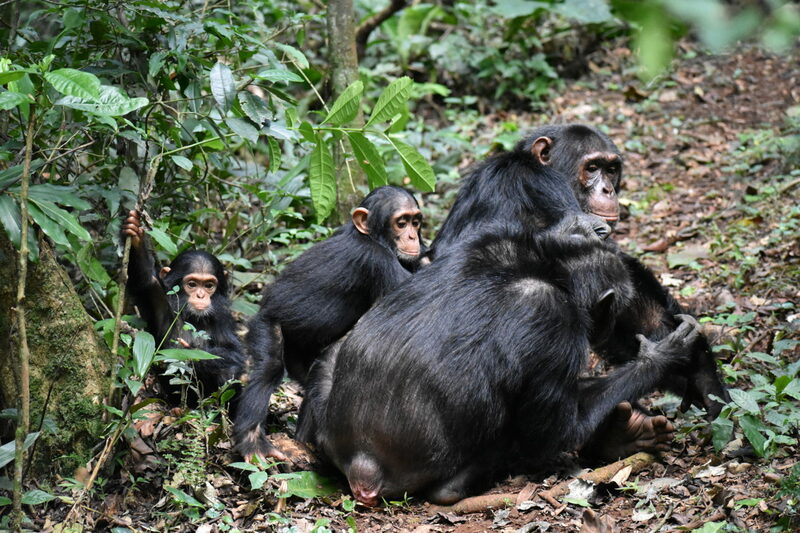 This system is a great one for a study like mine because chimpanzee mothers’ ranging preferences can lead their infants to have very different individual early life social experiences even though they are a part of the same community. However, it can also be difficult to make sure that I find and follow each infant and juvenile equally. 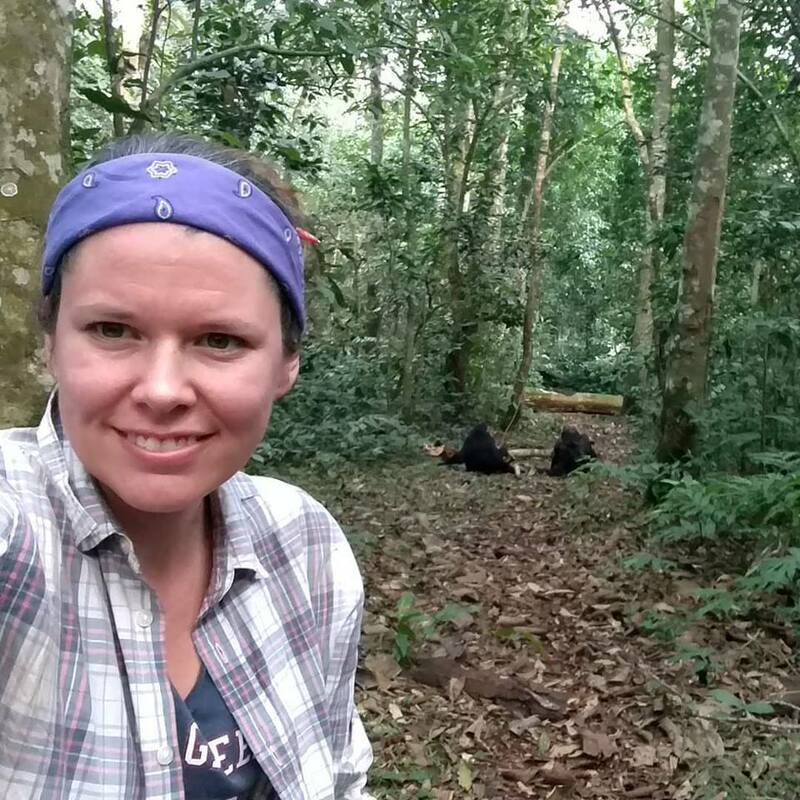 The academic “summer” term is always a great time to follow chimpanzees at Kanyawara because the chimps’ favorite food, Uvariopsis congensis, brings large, loud groups of them together. This is especially great for me not only because I get to spread out my follow time but also because I can capitalize on some rare opportunities to see more peripheral chimpanzees interacting in these large groups. As May rounded the corner, I was already excited for the 2017 Uvariopsis season. But I was completely unprepared for what we got! It started out just like it had in previous years, a few fruits ripening in a few groves here and there, mostly in the center of the territory. A few of our more central females and their offspring started traveling with the core group of high ranking males. As more and more trees ripened, more chimps joined the foraging party, following the ripening crop further and further from the center of the territory. 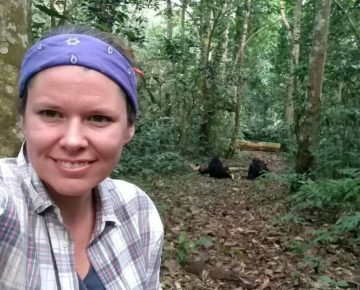 Each day fewer and fewer of them split off to forage on their own until, suddenly, one day in late May we realized that all but one of the Kanyawara chimps was here, foraging, and traveling, and sleeping together. Counter to their general proclivities, the community had effectively stopped fissioning and was spending their days traveling as a huge cohesive unit. We followed them like this for days, amazed at what we were seeing and the joy of seeing it. And then it just kept on going like that for weeks! Of course, the best parts for me weren’t necessarily the foraging or traveling but the huge increase in social time! With so much food to go around, rates of interactions, both aggressive and affiliative, soared. While the almost-adult males ramped up their physical displays, vying for dominance, they played with each other and other group members just as often. Mothers and their offspring clumped together to play and groom. In fact, some moms were feeling so social that they played with each other to the exclusion of their infants! As play rates and grooming shot through the roof, so did my data collection. 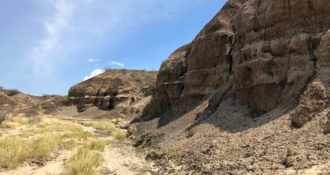 By the time that the Uvariopsis dwindled and the group finally began to fission again in mid-July, I had already captured multiple follows of every single infant and juvenile while they ranged, and played, with the whole community. Talk about wrapping things up on a high note! 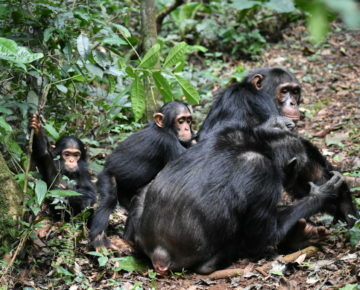 It’s not necessarily unique to see so many chimps together, especially among the very large communities like Ngogo (230+ members). But to see such a large proportion of Kanyawara together and spending so much time traveling and playing with each other was truly exceptional. It could not have been a more perfect summer for data collection, and it is an experience I will cherish forever. Utah at play, all day. 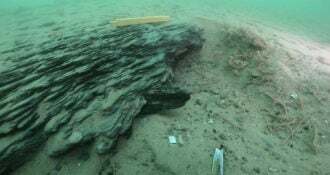 Leakey Foundation grantee Rachel Bynoe is a paleolithic archaeologist researching the underwater archaeology of the North Sea in Happisburgh where recent discoveries have radically changed our understanding of the timing and nature of early hominin occupation in Britain.